“I routinely play on Andy Cloth in world class events. Andy Cloth is consistent and gives me peace of mind” – Allison Fisher of England, 16x World Champion & BCA Hall of Famer. “The special Andy Pro Tour Cloth made for the American market makes it easier to control the cueball during a major event because it does not slide. And all my spin shots grab” – Mika Immonen of Finland, World 9-Ball Champion, World 10-Ball Champion, 2-Time US Open Champion, and Mosconi Cup MVP. “When I beat Oliver Ortmann and finished in the money at the World 14.1 Championship at the age of 76, I was amazed at how well I could control the cueball. I ordered Andy Cloth for my home table where I still play and teach on. Even my home poolroom Brass Tap & Billiards in Raleigh have all switched to Andy Cloth”- Ray Martin, 3x World Champion & BCA Hall of Fame. Author of 99 Critical Shots of Pool. “Andy cloth is fast becoming the industry leader for billiard cloth. Its consistency and durability is second to none and that’s why the biggest tournaments use Andy Cloth” – Daryl Peach of England. Winner of the World 9-Ball Championship. “I for one love playing on Andy Cloth. The reaction you get when spinning the cue ball is unbelievable! 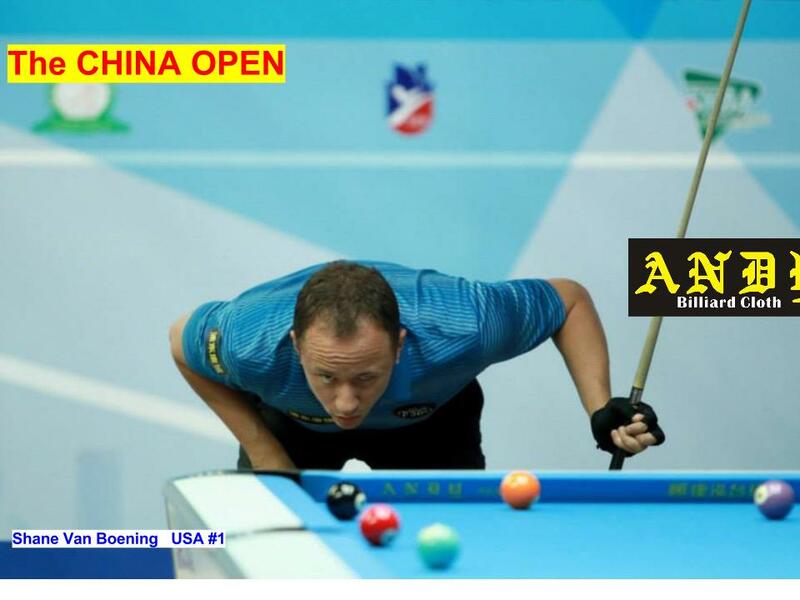 We use Andy Cloth in a lot of the huge Asian events and I think before long it will be used in all major pool events around the world. I would recommend it to everyone.” – Chris Melling of England, winner of the Mosconi Cup, China Open, and currently on the World Snooker Tour. “I’ve always been a fan of Andy Cloth. I’ve had it on my personal table for quite some time now and it’s still amazing! I was really happy when I heard the specially designed Andy Pro Tour Cloth was going to be used at the Women’s International Pool Championship in New York City. I felt more comfortable with my game and was able to make the cut in the grueling 7 match round robin. I’m so excited to officially be a part of the Andy Cloth family and represent such an excellent product! Andy Cloth is what I would recommend to any homeowner, poolroom, or pool tournament”– Shanelle Loraine of Guam, billiards celebrity and Runner-Up at the Ultimate Trick Shot Championship. “I noticed it’s much easier to control the cueball because even when the Andy Cloth is put on new, it doesn’t slide”– Tony Robles of the USA, Pro Veteran, league operator, promoter, & quarter-finals finisher during the 74th World 14.1 Championship. “Like everyone in the billiard industry, I have been aware of Andy Cloth for some time through their many event sponsorships, but never had the opportunity to play on it until the 2014 Women’s International Pool Championship in New York City. Having played since the mid ’70s, I’ve probably played on every type and brand of cloth imaginable. Before the event started, I overheard several of the other players wondering how the Andy Cloth would play. I was pleased to find that the cloth played great and required only minimal adjustment as compared to playing on the fairly new cloth on my home table. It was easy to play on, the balls rolled true and I found it fairly easy to control the speed of the balls – plus, I heard only positive comments from the other players. I would recommend Andy Cloth to anyone – whether for their home table, billiard room or any kind of tournament – from the amateur to the professional event.” – Mary Kenniston of the USA, winner of the Brunswick World Open and numerous WPBA Pro Tour wins.